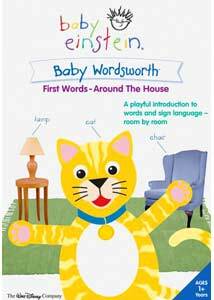 The latest entry in the Baby Einstein empire is Baby Wordsworth, which, in case you were wondering, has nothing to do with the poet. This time, the focus is on the home and things found in and around it. Thrown into that is a helping of sign language, which, as the credits mention, is intended to give some inkling to children that there are other means of communication beyond spoken and written words. If you've seen a Baby Einstein video or DVD before, you know the drill: simplified classical music plays while we see children play with toys, wind-up toys do their thing, sock puppet skits, and stock footage of nature scenes, families, and so on. In the midst of that are words relating to the topic at hand. It all has a generally lowkey tone that won't irritate parents. With this volume, there is a room by room look at things found in the house and yard, and see its sign language translation, performed first by actress Marlee Matlin, and then by a child. I was dubious about whether kids would bother paying much attention to this, but that was before I recalled that kids love to watch their favorite shows ad nauseum, and within four or five viewings, my son was doing his best of reproduce some of the sign language. That said, unless kids continue on learning sign language beyond this video, it's not going to have much practical use. My son hasn't watched the disc in a while, so I'm not sure how much he recalls. But if simple awareness of sign language was the goal, it's a success. If you already have some of the Baby Einstein series, I'm not sure if this volume is a "must buy," unless you like the sign language idea and want it for that reason. If your kids like the other volumes, there's no reason they won't like this one. Image Transfer Review: Baby Wordsworth mixes shot-on-video footage with film footage, and it all looks fine. Colors are crisp and clean, and it has a glossy look meant to appeal to children. Nothing really complain about here. Audio Transfer Review: The kiddie-fied classical music is well-served by the Dolby 2.0 track, which has only a few spoken words otherwise. There's nothing abrasive here to push the soundtrack, which is probably for the best. Extras Review: In addition to a Repeat mode (aka the Electronic Babysitter/Lazy Parent mode), there are the following extras: Discovery Cards (4m:43s), showing words from the main feature in sign language, which includes a signed version of the alphabet (:59s) with Matlin. Signing With Baby (2m:22s) presents a variety of simple phrases in sign language, such as "I love you," "I'm hungry," "please," and so on. What Will We Find? (3m:23s) goes through the house, asking that question of little viewers. Three Puppet Shows (2m:07s) feature the sock puppets from the main program in quick vignettes. Storytime (3m:32s) reads a story from the Baby Einstein book series to the tots. Toy Chest is a slide format section wherein parents can find out where all the toys used in the show can be acquired. Finally, a preview for the next "Einstein" series, Little Einsteins is included if you want to see what the graduates of this series have in store from the same producers. Baby Wordsworth provides another dose of the Baby Einstein formula, and will consequently no doubt please its target audience. The addition of sign language is an interesting touch for this volume. The DVD provides a solid presentation of the program.